절벽 위의 바위가 거북이를 닮아 구담봉(龜潭峰)이라 전한다. 구담봉의 장회나루 쪽으로는 퇴계 선생을 사모하던 기녀 두향의 묘가 있다. 조선 인종 때 백의재상이라 불린 주지번이 낙향하여 칡넝쿨을 구담봉의 양쪽 봉우리에 걸어 타고 다녀 신선이라 불렸다는 전설 등 이야기가 많은 명승지다. 구담봉은 남한강 물줄기를 따라 펼쳐지는 깎아지른 장엄한 기암절벽이 제비봉과 금수산, 멀리는 월악산에 감싸여 있다. 이황, 이이, 김만중 등 수많은 학자와 시인 묵객이 그 절경을 극찬하였으며, 지금도 충주호에서 배를 타며 바라볼 때 가장 아름다운 곳이 되고 있다. 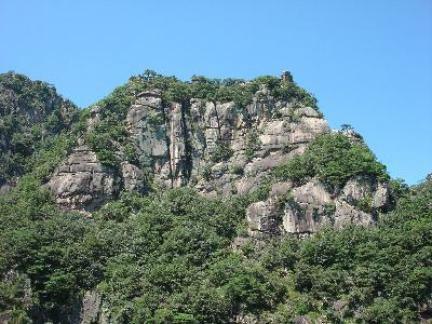 Gudambong Peak, rising above precipitous cliffs along the Namhangang River, was thus named because it is said to resemble a turtle crawling up the cliffs. 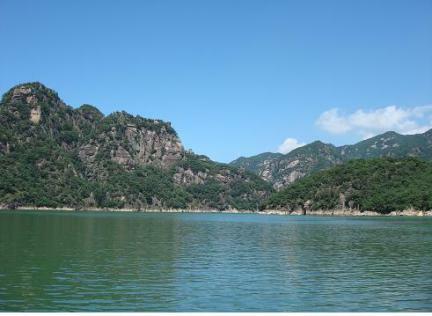 The peak is comfortably surrounded by Jebibong Peak (Swallow Peak), Geumsusan Mountain and Woraksan Mountain. The exquisite scenery was admired by numerous scholars, writers and artists, including Yi Hwang (1501-1570, pen-name: Toegye), Yi I (1536-1584, Yulgok) and Kim Man-jung (1637-1692, Seopo). Various anecdotes and legends are told about the area around the rocky peak. A solitary grave near Janghoenaru Ferry Landing is said to be that of a courtesan named Duhyang, who fell in love with Yi Hwang when the eminent Neo-Confucian scholar was serving as county magistrate here. Ju Ji-beon, known as the “minister in the white robe” during the reign of King Injong (r. 1544-1545), was called a Daoist immortal by local residents as he connected two rocks on either side of the summit with arrowroot vines and freely moved from one rock to another by walking along the vines.